Anthropomorphic photos of animals are prominent on blogs and tumblogs for obvious reasons. They are effective at graphically conveying human behavioural and emotional concepts… and are usually quite cute. I’ve seen this photo a lot recently, including on a blog post by an animal conservationist. 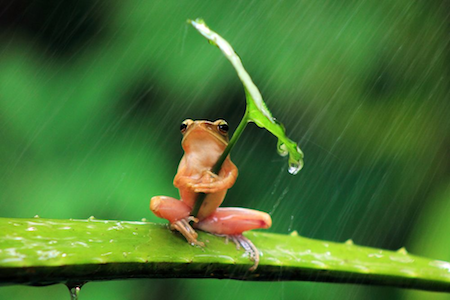 It seems “frog wearing umbrella” first appeared on the web last year, when it was submitted to National Geographic’s Your Shot site by Indonesian photographer Penkdix Palme. The editor’s note and comments make interesting reading. Aside from any ethical issues regarding the authentic representation of animals in their natural habitat, speculation about how the photo was achieved extends beyond the usual suspicion of Photoshop fakery to suggest harm may have been inflicted on the subject, including the use of glue and the breaking of limbs. The photo appears to be just one of many in the genre.